Human connection can best be described as the love, belonging, and empathy that exists between two people or a group of people. It’s interesting actually because we categorize these to the spiritual realm – in the Church we call it “community” – but it is also observable by scientists. Special parts of our brains light up and synchronize with the people we are “in community” with. We connect and resonate. That connection paves a way for cooperation AND it meets a deep human need for social living. When we have genuine connection, the brain is free to focus on solving problems and growing new skills. But without it, we suffer the consequences of survival state. We often hear how connection takes time. Building trust in a relationship where both parties feel seen + loved is hard to come by in short bursts. 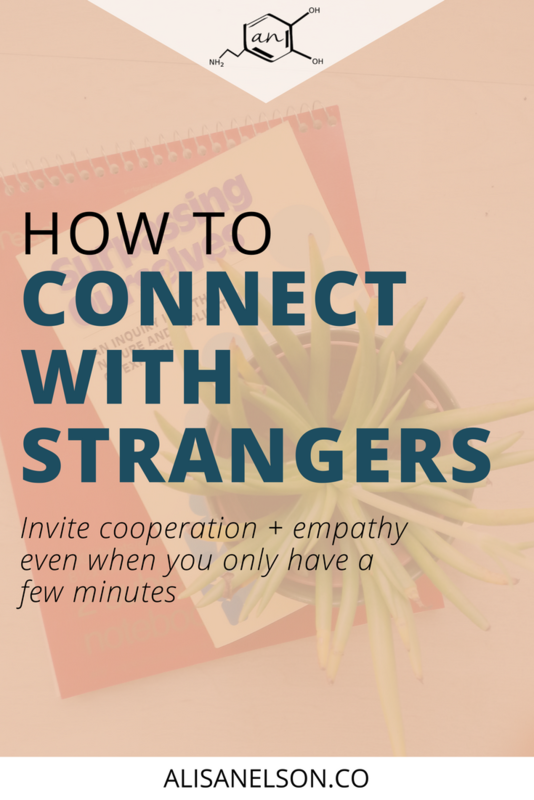 For those who spend the majority of their time serving people they will only meet occasionally – but require cooperation — the question becomes, how do you experience that connection described above with a stranger? Today I hope to give you an effective way forward. But first, why do we really care about human connection? The biggest reason is because we are wired for it. Social connection is a basic need – demonstrated by a newborn baby. Even with an immature brain the social centers are active helping them form attachment to their parents and training them to cry when that attachment feels absent. And we know it carries on into adulthood – just ask any mother about her compulsion to pick up her crying babe. The mammalian brain has adapted in order to increase its probability of survival. And in the words of social psychologist Dr. Matthew Lieberman, the brain bet on our being social. We even have a warning system that goes off when we experience social isolation or rejection. The neurotransmitter serotonin is used by the brain to motivate us to take action when it senses a loss in social status or connection. The hormone oxytocin pushes us to seek social support during times of stress. What does connection do for us? Let me tell you a secret about me. Ok, it’s probably not really a secret because if we met you’d see it right away. I’m a nervous-laugher. And it can get really bad. From people talking to me about my kids in the grocery checkout to meeting a new person at church, I have a hard time keeping myself from just filling the void with my nervous laugh. I blame it on my Relator strength. It gives me a strong desire to empathize…but doesn’t necessarily mean I’m very good at it. I think I laugh for a couple of reasons. The first is that giggling releases endorphins – I can only assume my brain picked up the habit at some point and the release feels good, so it stuck around. The second reason is that laughter is a way to build connections with people. When someone is saying silly things to my kids (that they don’t understand), my laughter shows them that I don’t consider them a threat. I may not know what to say but I recognize they mean no harm and they can walk away enjoying my kids’ smiles instead of my scowling or confused face. This is the same reason I laugh at my daughter’s jokes. She’s gotten pretty good at telling them but also, I want to respond in a way that shows her there is space for her to be silly. She belongs here. She is loved and seen. When she feels that deep sense of belonging she can focus better. She is more cooperative. She is kinder to her brother. She asks for help to solve problems as if we’re a team. In people-focused work, you need all these things too. You need engaged and connected people. Whether they are kids or adults. But how do you do that if you only see them for a few minutes? Or only once every week / month / year? Most people are stressed about something. Whether it is directly related to you or not, you can expect they have other things on their minds + hearts. Stress acts to bring our attention inward – as we become hyperfocused on our own pain. This disconnects us from our environment and the people around us. What’s more, feeling alone in an unfamiliar place brings uncertainty. Making them feel vulnerable. What’s our reaction to vulnerability (in most cases)? Pull in even more. Control, deflect, numb. When you approach a person who feels distant, unkind, or selfish the best starting point for making connection is to let all that go. If you respond accordingly, you will further alienate the person, and you’ll walk away feeling pretty crappy as well. But internally recognizing that this person has a story that you don’t yet know opens you up to be curious and kind. This also tells your own stress system (the one getting fidgety over this person who seems to be rejecting you) that you don’t need to feel threatened. That you have what it takes to overcome this obstacle. In turn your brain will focus its energy on solving the problem rather than on your own controlling, deflecting, and numbing habits. Cue eye roll. I know “small talk” is commonly put down. Especially by those of us who want a reputation of being all deep and stuff. I’m talking about me, ya’ll. Working on it. But small talk is a powerful tool in the pursuit of human connection. Questions like “how was your weekend” and “how’s your family” can be ok entry points. But when you ask a person a question about their day or their lives it needs to be accompanied by nonverbal signals that you actually intend to listen. We all know what it’s like – the friend who says “how are you? !” as they blow right past you with no intention to hear your answer. Versus the friend who asks the very same question but we sense intuitively that they are present + focused on your reply. You can be that person. Even to strangers. When I worked at Starbucks I was surrounded by seasoned baristas. And it was instantly clear who the store favorites were. They were the men and women who made an effort to look at customers, remember names, and ask follow up questions about yesterday’s interview. Customers lingered at the bar, celebrated our birthdays with us, asked for pictures of our kids, told us stories about theirs, and we bought their girl scout cookies. One even gave my husband’s new business a shout out when he launched a kickstarter campaign. All because when we asked “what’s going on today?” — and they answered — we listened and asked more questions. My favorites were the quiet ones. I tried hard to not be intrusive but wanted them especially to know that even they are seen. They don’t need to be loud or share their life story, but I see them, they belong here too, and we are so grateful for their presence. You know what also happened at that store? We’d serve well over 100 customers in a couple of hours. So I’m not talking about a handful of regulars that would sit around and chat politics. I’m talking dozens that we would interact with for maybe two minutes from the time they ordered a drink to when they left. We mostly operate on habits. It is energy-saving for the brain. Then, in new situations, we depend on previously established models for how to interact and behave. Mental models composite themselves whether we are aware of it or not. The formation of mental models is incredibly important. They help us survive and decrease the burden of our environment as information is compressed into one big image rather than many discrete parts. The downside is we stop engaging in the way we think about our environment – and therefore how we feel about it. We stop considering how our mental model might need some updating. When a stressed out person approaches you, it is very likely that they are interacting based on habit. This means that while they talk to you, answer your questions, and complete the necessary tasks they are not really interacting with YOU. They are interacting with the “you” of their mental model. That could be based on a person they met years ago or an experience they can’t even remember triggered by the way you greeted them. The brain is crazy, right? So you have the opportunity now with this information to alter your approach. Invite them out of autopilot. The small talk you use, the environment of your office, the way you make eye contact – these can help to coax a person into the present moment. Of course you can’t force a person to be present. But you can set the tone by being present yourself. Talking to yourself about what you see, getting curious about another person’s world, simulating in your mind what their life might be like. These are all actions that the brain is actually really good at but like any muscle it must be used to become prominent. When you are present you become naturally more empathic because your brain is tuning in to the immediate environment rather than functioning off of old scripts and habits. With empathy we get connection. And with connection we get cooperation and a better sense of wellbeing for all. remind yourself why you are doing this work. Look for something right this second that you genuinely appreciate. Connect your current work day with your future goals as a necessary piece in your personal story. Think of your biggest supporters. Each of these can act to pull you back into the present moment and ground you in the midst of stress. These are also associated with our basic need for social standing and support. In turn they can stimulate the release of neurotransmitters that will help you respond better to stress and give you a rush of good feelings (making presence of mind feel good). Consider your own experiences – where have you felt welcomed, seen, understood? How has that affected your behavior and emotional outlook? What is your current behavior like at work? How do you greet people? What is the usual result? Have you seen an instance where the way you approached a person seemed to bring them out of their shell? What did you do? How do you currently think about the people you interact with at work or around town? Start noticing the thoughts you have first and how those thoughts impact your openness to them. Challenge yourself in the small talk department – start to ask follow up questions and make eye contact. Put more thought into your comments + questions — weather and the weekend tend to be favorites but is there something else you can ask that will get more than an “oh yea I like the fall colors too”? Do you notice a certain time of day when your energy has waned and talking to people gets harder? This post about overstimulation might be helpful if you’re an introvert and get burned out by the end of the day. Set a timer on your phone or a note on/under your coffee cup that cues you to re-engage in the present moment. It doesn’t take much to help a person move beyond uncertainty + isolation —–> connection + cooperation. It’s important to keep your efforts focused on what you can control – and that’s your own state of mind. Remembering that people are naturally preoccupied by other stuff, being intentional with your small talk, and keeping your brain awake so you can respond appropriately to the moment will help you gain trust even in only a few minutes time.